Join us for a NIGHT IN THE WILD, an evening with Sarah Jakes Roberts for a special night of sisterhood, faith, fun and fashion unlike anything you’ve ever seen. BUT WHAT IS A WILD WOMAN? In an area that would be inhospitable for anyone else was the place SHE THRIVES. “Then the woman fled into the wilderness where she has a place prepared for her by God…” (Rev 12:6) Whether you are climbing up corporate ladders, fighting for your marriage, starting a business, or raising children against the odds – God has designed this wilderness – long before your arrival – for you to not just survive, but to thrive. Join us for this ONE NIGHT EVENT that will awake the wild woman in you as you are encouraged and empowered spiritually and practically to evolve into the highest version of yourself no matter what season you are in. Join us for our 22nd annual college fair featuring the annual Battle of the Bands competition and Rep Your College Sunday! Our Friday kickoff will host a Battle of the Bands competition featuring our middle school, high school, and collegiate marching bands. Our college Greeks will also share and come ready to step and stroll. This ticketed event helps us provide scholarships to dozens of students each year. Our 22nd annual college fair will once again host over 50 colleges with many featuring on-site admissions and scholarships. Bring your transcript and test scores and come ready to apply. We’ll have 8 special guest speakers to share on various topics ranging from financial aid to testing, college life, and more! 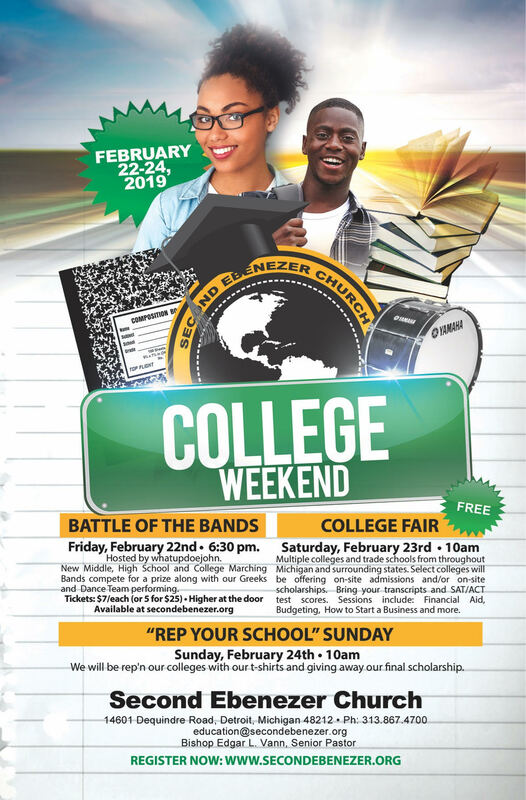 Rep your favorite college during morning worship as we close College Weekend and celebrate our rising scholars! Join us for our 22nd annual college fair! This year’s college fair will once again host over 50 colleges with many featuring on-site admissions and scholarships. Bring your transcript and test scores and come ready to apply. We’ll have 8 special guest speakers to share on various topics ranging from financial aid to testing, college life, and more! Second Ebenezer has awarded more than $400,000 in scholarships and has reached more than 7,000 high school students and young adults with the promise of higher education. Help us celebrate and honor our Pastor of 42 years strong! 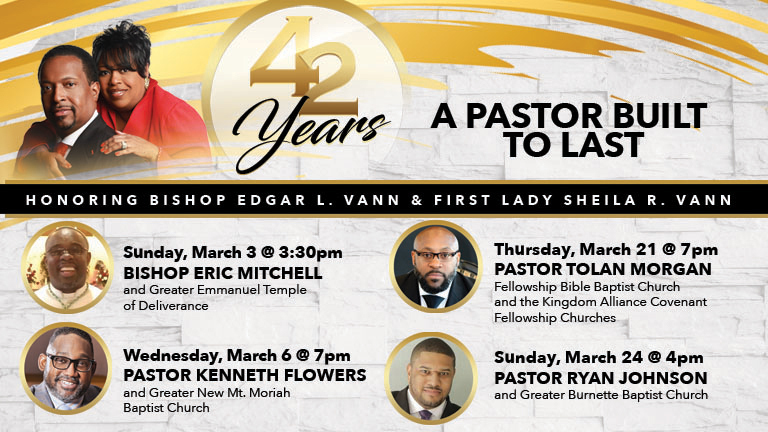 Bishop Eric Mitchell and Greater Emmanuel Temple of Deliverance will join us for the kick-off of our 42nd anniversary services! Pastor Kenneth Flowers and Greater New Mt. Moriah will join us in worship! Pastor Tolan Morgan and the Kingdom Alliance Covenant Fellowship Churches will join us in worship! Pastor Ryan Johnson and Greater Burnette Baptist Church will join us in worship! 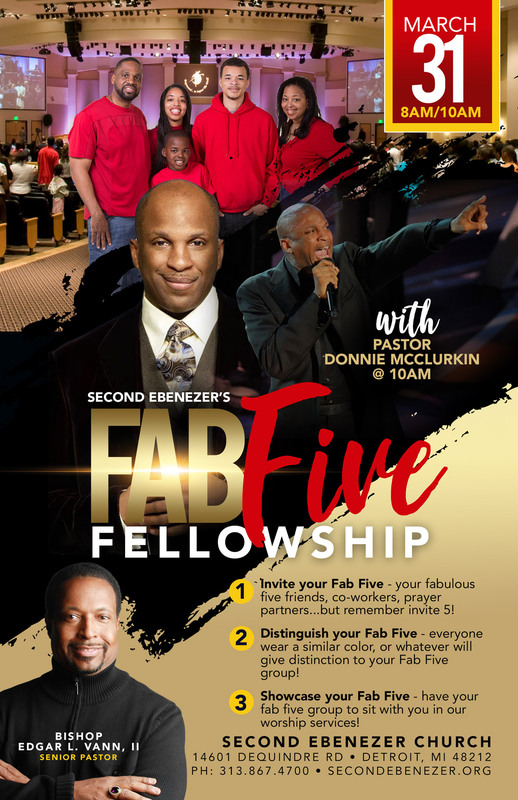 Invite your “Fabulous Five Friends” to worship with you! Wear matching apparel and celebrate Jesus with us. 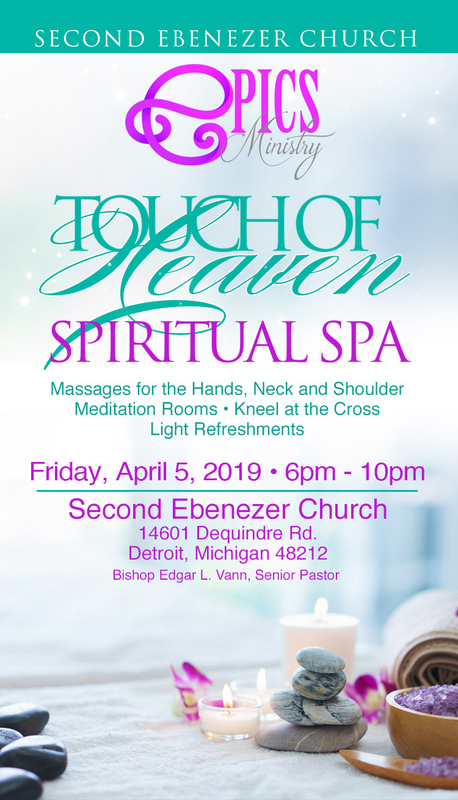 Join the EPICS Ministry for an evening of spiritual relaxation and worship! Men and women are welcome to come and enjoy neck and shoulder massages, meditation, and more!